Being one retired naturalist's musings on the natural world. By Donald B. ZEPP, Ph.D. 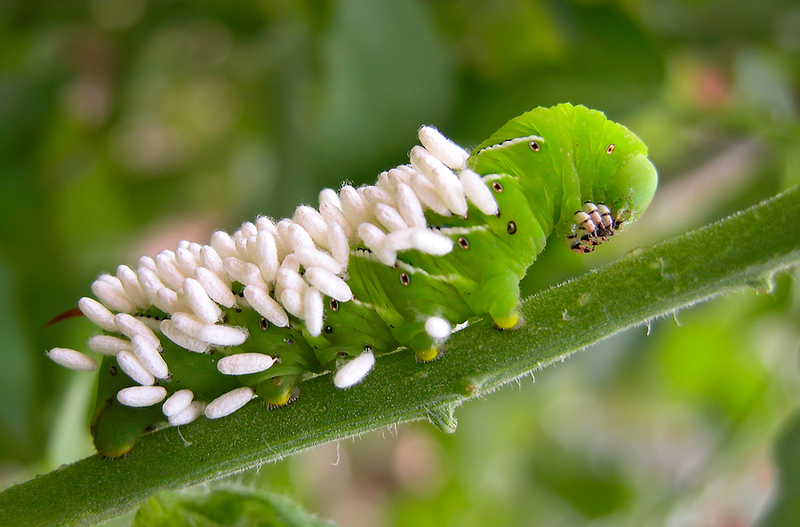 Most people who have ever tried to grow tomatoes have certainly run into hornworms. These caterpillars are the larvae of hawk moths. 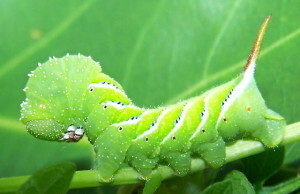 Strangely enough, the hornworm most commonly found on tomatoes is not the tomato hornworm, Manduca quinquemaculatus (Haworth), but the tobacco hornworm, M. sexta (L.). As common and large as this pest is, many people never see (or never know they’ve seen) the adult moths. They are nocturnal and do their very best to look like tree bark when resting during the day. So what are those cute little white tufts? No, they are not decorations the caterpillar has chosen, they are cocoons. Each cocoon has been spun by a tiny Cotesia congregata wasp larva which hatched from an egg laid inside this rather unfortunate hornworm. The hundreds of eggs in each caterpillar hatch in a few days and the larvae then feed on the caterpillar from the inside for a couple of weeks, causing its ultimate demise. This killing of the host, BTW, is the difference between a parasite and a parasitoid: a parasite feeds on another organism but does not usually threaten the host’s existence (think fleas or lice–annoying, but not inherently deadly). Conversely, a parasitoid feeds on its host, and in so doing, kills it–this is the case with these tiny wasps. And, just for fun, here’s a video I made using my son’s microscope. You can see a larva’s head just emerging through the integument, and next to that one, a larva busily making its silken cocoon. Zepp, thanks for a fascinating description, it really is a jungle out there, is it not? l got interested in the life cycle of the liver fluke (thanks to Lyall Watson’s Supernature), and I wonder if this kind of information gives you an opinion on Darwin’s evolutionary theory — if so, I would be very interested to hear it, if you felt like approaching the subject. Also, l realise that we humans tend to anthropomorphise this insect behaviour, but is there another possible scenario where cooperation rather than deadly combat could be happening here? Does the dying moth know it will subsequently view the world through the eyes of a wasp? Would any behaviour that you observe support such an idea? A jungle, indeed. Mother Nature is not a kind soul, I fear. Of course, not only do we see the natural changes involved in selecting for a population of aphids that can now feed on a toxin-laden host (nicotine is often used as an insecticide! ), but we are perpetually selecting insect populations that have the genes to become resistant to pesticides. I see no evidence that there is any benefit to the individual to being killed and eaten 🙂 There have, of course, been primitive peoples who have attempted to gain another’s courage or strength, etc. through cannibalism, but clearly there is no such effect. Thus, I think we’re stuck with the rather unromantic notion that the vast majority of the animal world becomes more developed and complicated only through its assimilation of other life, i.e., animals have to kill something to live. Entropy being what it is, the evolution over the eons of increasingly advanced organisms has only been possible by an abundant and constant flow of energy from our sun: It’s a darned good thing it’s still pumping out all that energy, for when it stops, all life on this planet stops (yes, I know the earth will have fried to a crisp long before that–I’m just being melodramatic). In truth, I certainly don’t see the cruelty of the natural world as being coöperation at all, but neither do I see it as being “deadly combat.” I see it as being simply what works and the fact that “what works” is subject to change has led to the ever-changing diversity of life on this planet. I can certainly see that there’s no benefit in being killed and eaten from the individual’s point of view ( and such altruism would ring false as the individual’s motivation ) but I do wonder if we sometimes regard our own reactions to being eaten or parasitised by a predator as applicable to other, very different life forms. I’m hoping that when we understand a little more about ‘entanglement’ we might get a more accurate picture of how differing levels of purpose may exist in the same being, reflecting the whole individual, the cellular material, and the molecular level. From my point of view, all represent consciousness in one form or another, at a particular level of complexity. I do see that what is there, is what works — that’s the perfect test of any system. I also suspect that we worry (because of our reflective powers) more than any other life-form on the planet, and that what looks like a jungle to us, is a briar patch to others. Perhaps Pangloss played the banjo …. Great first blog post Zepp from a BHO fan. I’ll check back in often. Science blogs are indeed tough because unlike say political or ideological blogs, a scientist has to check facts and recent developments in their field lest they look like an oaf. Don’t be discouraged if the comments don’t flow in at first, indeed my take is that blog comments usually vary inversely with the complexity of the post. But this is a great start! I was unaware of the parasite/parasitoid difference. This reminds me of a pond in Rocky Mountain National Park that I wanted to use as a source of mosquitoes for my dissertation. Every mosquito larva I collected there (and I collected many hundreds) was parasitized by one or more nematodes. None of the mosquito larvae survived to pupate. Oddly, nearby pools were free of the nematodes. Go figure. Clearly, an insects life is fraught with danger. When I consider how many individuals of so many species (and I mean species of anything) never make it to maturity, I really appreciate simply being alive another day–it’s really quite an accomplishment, isn’t it? It is an amazing accomplishment – and it’s a lot nicer not having huge braconids around that use humans as the hosts for their offspring. I am a Hampton Virginia master gardener and would like to use your photo of the larvae emerging. 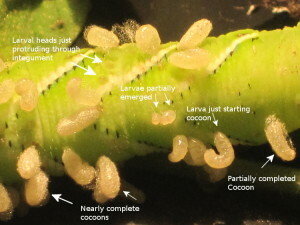 I love the descriptions of the different stages as they begin to pupate. I am working on a adult/immature insect matching game. It would only be used for education purposes. May I have your permission to use? Sorry for the delay in response–I just today saw your request! You are absolutely welcome to use the photo and/or the video. I ask only that if you use it for any commercial purpose that you give me credit.